Post-starburst galaxies: the missing link in galaxy evolution? Surveys of the nearby universe show that we can divide galaxies into two types if we look at their colours — we find a “blue cloud” of star-forming galaxies, and “red sequence” of passive ellipticals without active star formation. Besides their colours, there is another important difference between these two types of galaxies: their shape, or morphology. It turns out that most blue galaxies have a disc shape, while red galaxies are spheroidal. The majority of massive galaxies we see around us are spheroidal passive galaxies. But how and when do galaxies evolve from star-forming discs to red-and-dead spheroids? In this paper, the authors investigate post-starburst galaxies (PSBs, or E+A galaxies as described in the astrobites galaxy classification guide), which are galaxies that have only recently stopped forming stars. One narrative of galaxy evolution suggests that galaxies move from the blue cloud to the red sequence following a rapid quenching of star formation. By shutting down star formation, the hot blue stars rapidly die out and the galaxy is left with an old red stellar population, explaining the transition in colour. However, this doesn’t explain the additional structural transformation that changes galaxies from a disc to a spheroid morphology. PSBs, rare galaxies caught in this transition phase, might hold the key. PSBs are traditionally identified by their spectral features, usually the strong absorption lines associated with the A-type stars that dominate these galaxies’ starlight. However, spectroscopy limits us to looking at nearby, bright galaxies. 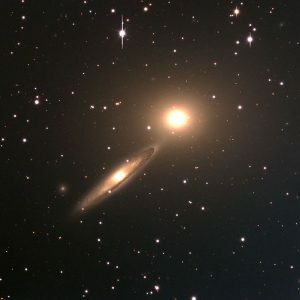 Very distant galaxies are much fainter and so require very long exposure times on the most expensive space telescopes. The authors of this paper use a novel technique, identifying “supercolours” that allow them to categorise galaxies using just photometric data — which is much cheaper as it can be done from the ground! This method allows them to obtain a large sample of galaxies at high redshifts (z > 1), investigating an earlier period in the history of the universe than other studies of PSBs. The authors are interested in two properties of PSBs: the size (or compactness), and the morphological shape. The authors then compare these properties of PSBs to those of the blue cloud and red sequence galaxy populations. Figure 2: These plots show galaxy mass plotted against the effective radius Re. Blue star-forming galaxies are shown as blue points, red-and-dead galaxies are shown as red points, and the PSBs are shown in black. The left-hand figure shows the individual galaxy measurements and a representative error bar, while the figure on the right shows the mean value for each mass bin. The passive galaxies and PSBs are clearly more compact (smaller Re) than the star-forming galaxies. Figure 4 in the paper. One way to measure the compactness of a galaxy is to use the effective radius, which is the radius within which half of the light of the galaxy is emitted. In figure 2, the authors compare the different populations of galaxies in their sample, and find that passive red galaxies are much more compact than blue star-forming galaxies. This is not a surprise, and agrees with previous observations. The interesting result here is that the PSB galaxies are also very compact, similar to the red population and in fact even more compact in the high mass range. To investigate the shape of the galaxy, the authors measure the Sérsic index, a parameter widely used to characterise galaxy morphology which describes how peaked the light profile is. A low Sérsic index implies a disc-dominated shape while a high index implies a bulge-dominated, spheroidal shape. The result here, shown in figure 3, agrees with expectations: the blue population galaxies have low Sérsic indices corresponding to disc morphologies and the red population galaxies high Sérsic indices indicative of spheroid morphologies. The PSB galaxies again are very similar to the red passive population, with relatively high Sérsic indices. Figure 3: These show the Sérsic index distribution for the three types of galaxy in the sample, which corresponds to galaxy shape. In the histogram on the left, we can see that the PSBs (black) have relatively high Sérsic indices, very similar to the red passive galaxies. This implies both populations have spheroidal shapes, compared to the low Sérsic index, disc-dominated blue galaxies. In the plot on the right showing the Sérsic index plotted against galaxy mass, the same trend is visible. Figure 8 in the paper. The authors conclude that since PSB galaxies have very similar morphological characteristics to red-and-dead passive galaxies, the transformation of their structure from disc to spheroid must have happened before or during the event that shut down their star formation. This work provides an important observational link between star formation quenching and morphological transformation. The very compact PSB galaxies are interpreted to be “proto-spheroids”, which will eventually evolve into the massive red elliptical galaxies that we observe so frequently in the local universe.